In many textbooks, predominantly targeting medical students, i.e. anatomy, histology and physiology, or in more specialized areas of interest such as immunology or neurobiology, the innervation of immune organs is still something of a mystery as concerns the peripheral nervous system. One reason may be that the fields of immunology and neurobiology have been mostly separate disciplines for many decades during the last century. The evolution of the aforementioned areas of expertise together with many different other areas, e.g. endocrinology and psychology, have eased this disconnect. Consequently, new fields were defined nearly 40 years ago like psychoneuroimmunology  and followed by subsequent work of many others [2-5]. These were the first steps taken for revealing possible communication pathways between the immune and the nervous system. Much of the early research focused on humoral pathways [6-8], thereby establishing groundbreaking new concepts like that of neuroimmunotransmitters . This combination of terms evolved as it became obvious that more and more classical communication factors of the immune system like cytokines, for example, are also intrinsic factors of neurons in the central nervous system. It became apparent that more and more classical neurotransmitters are used by immune cells for intrinsic communication between these cells. Most of these neuroimmunotransmitters can be used by both system for extrinsic communication between the nervous and the immune system. But although these humoral pathways are of great relevance, the nerves still have to reach the immune cells for establishing communication that will be more specific than endocrine factors arriving via the blood or the lymph fluid. Here, the autonomic nervous system plays a central role by controlling efferent pathways with nerves transmitting information from the central nervous system to the periphery. This is more or less limited to the sympathetic nervous system with a mostly obliterated parasympathetic nervous system [10-12]. Conversely, scant afferent pathways of the autonomic nervous system are described even in a general neuroanatomical aspect, and even much less for the immune system. In standard textbooks the chapters about efferent and afferent parts of the autonomic nervous system can be seen in a ratio of approximately less than 25:1 . Therefore unsurprisingly, only a handful of publications and reviews addressed these possible afferent pathways for the immune system and its organs [14-17]. This information opens up many questions including the possible contacts to the somatic nervous system. Using current knowledge direct somatic efferent pathways to the immune system are difficult to imagine. Afferent projections from primary autonomic sensory neurons residing in the dorsal root ganglia on secondary neurons in the spinal cord, which at the same time also get projections from primary somatic sensory neurons in that ganglia, are already described for referred pain pathologies and therefore also thinkable for the immune system. With that understanding, our group decided to start with a consequential basic approach, using a staining technique for neural structures in the lymph node that is commonly used in the nervous system. Staining for intermediate filaments which in axonal and dendritic projections are defined as neurofilaments. 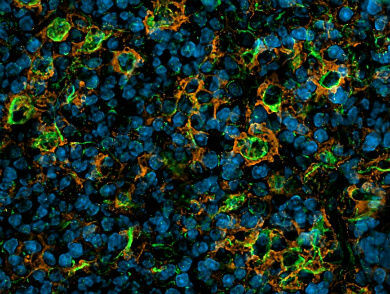 Although we have to note that this immunohistochemical staining technique is challenging in immune organs, results turned out to be really impressive and exciting with myriads of neural structures in the lymph node of rats; interestingly, despite the simple staining, nobody has encountered it before, as was published recently . Beside countless neurites all through the lymph node, large bundled nerves have been eye-catching, coming through the hilus and dividing up in the hilus and medullary part of the lymph node, which obviously were not associated with any blood vessel. 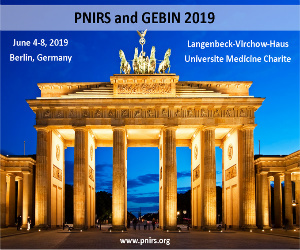 This is of great importance, because former publications always described neural structures in the parenchymal region either without any hint of their origin or as branching from neural structures associated with blood vessels. There was also another outstanding phenomenon visible, showing always the densest appearance of single neurites in the subsinoidal layer of the lymph node, which we named “subsinoidal” as being located as a narrow belt directly under the subcapsular sinus (see figure 1). Figure 1. Subcapsular sinus of a rat lymph node. 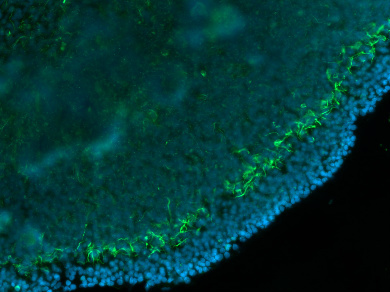 The green neurofilament signal demonstrates single wAPC and abundant neurites in the subsinoidal layer directly beyond the sinus (DAPI in blue /20x magnification). But the most important finding was the observation that single cells were reached by neurites, which also enclosed that cells with a dense neural meshwork which in the immunohistochemical picture appeared like a glass fishing float. This impression was based on the filamentous character of the neurofilament staining and the fact that only the cell body and not membranous extensions were covered by that neural structures (see Figure 2). Figure 2. wAPC in a human lymph node: Note also here the arriving neurite on the left top of the cell and the fine neurofilament (green) meshwork surrounding only the cell body (100x magnification and 3D reconstruction / DAPI in blue). Those omitted extensions turned out later when these innervated cells were characterized as being of myeloid character and as having antigen presenting capacities, therefore probably being macrophages or dendritic cells (see Figure 3 and Figure 4). If any, then this connection could be called neurally hard-wired according to our view, so we named these cells wired antigen presenting cells – wAPC. Figure 3. wAPC in a rat lymph node with double positive CD11b/c (orange) and neurofilament (green) signals side by side with single positive (neurofilament) wAPC. Notice that always only the cell body is enclosed by neural structures, whereas the membranous extensions visible through the integrin CD11b/c are omitted. The cell on the upper right shows the arriving neurite (100x magnification). When it comes to the use of the term “innervation”, because of the strictly neurobiological view that a cell only is innervated if synaptic transmission can be shown, and due to the finding that with the wAPC, synaptophysin as a classical marker could not be demonstrated, 40 years ago, most researchers would have dismissed this as a psychoneuroimmunological idea. Moreover, it is incomprehensible to us, why the nervous system should build up that many neurites and close contacts to thousands of single cells even in one lymph node without having the cause of innervation. Indeed we think that this new innervation morphology, which cannot be seen in any other contact of neurons to other neurons or neurons to cells in other tissues has very interesting implications, opening up an evolving concept. Figure 4. 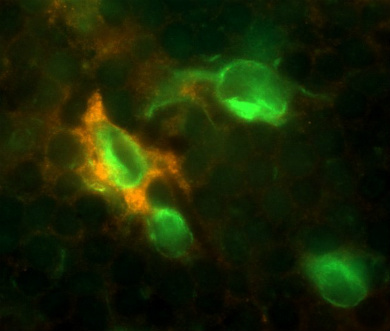 T-cell area of a rat lymph node indicates the co-localization of the neurofilament signal (green) and MHCII positive Antigen presenting cell in orange. Note also here, like with CD11b/c in figure 3, the MHCII signal follows the membranous extensions of the antigen presenting cells, whereas the densely enclosing neural meshwork always only surrounds the cell body. 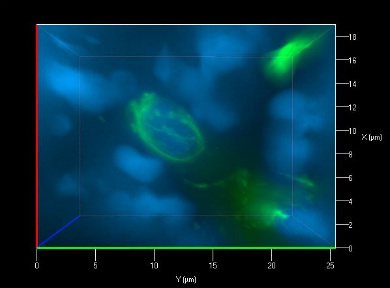 (40x magnification /deconvolution / DAPI in blue). For this idea we have to go back to the humoral pathways and all the neuroimmunotransmitters that have been established in the recent years, which are used not only for extrinsic but also for intrinsic communication of the immune system. Together, we want to consider the abundant noradrenergic sympathetic innervation, probably also cholinergic parasympathetic innervation and at least the findings about all other issues, for example the different neuropeptidergic innervation. Imagine the situation the immune cells are presented with. Any job they have to do requires that they are able to integrate many different signals from different sources but through identical molecules, they are almost drown in an ocean of communication factors, a cocktail nearly impossible to tease apart. Comparing it to the communication at a neuronal synapse, the synaptic cleft with its dimensions in the nanometer range, closely confined by glial cells, the situation for an immune cell in neural transmission would be quite harassingly. The close contact of neural structures to the wAPC probably helps in getting directed information to and from immune cells, in this case macrophages and dendritic cells, separating them from the surrounding with its many different signaling molecules. 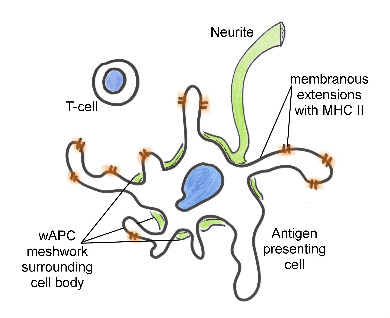 Remembering the finding, that only the cell body is enclosed by that neural structure, omitting all membranous extensions especially dendritic cells have when presenting antigens to T-cells, these wAPC may also have different membrane domains for different tasks to do (see Figure 5). Figure 5. Schematic illustration of a wAPC: In green the arriving neurite is shown, which then encloses only the cell body by omitting membranous extensions, where in this example MHCII is shown in orange. The two different membrane regions of the antigen presenting cell (marked here by “wAPC meshwork surrounding cell body” and “membranous extensions with MHCII”) may function as different domains regarding different functional communication aspects. In fact, the membrane region enclosed by neural structures is always located around the cell body, where the nucleus resides, which would be called perikaryon when talking about neurons. And exactly that neuronal region integrates most of the incoming signals, so what about the wAPC? Is it integrating also? – It was not possible to stain any marker for the known efferent sympathetic pathways of the autonomic nervous system and first tracing experiments showed confirming negative results. – MAP2 and the presence of axonal growth cones points into the direction of a dynamic system, but if this indeed the case, at least some afferent signals have to inform the nervous system about the necessity of innervating these APC as wAPC. And as always, the densest appearance of neurites could be observed in the subsinoidal layer of the lymph node, although there is no evidence yet, we strongly suggest that at least some of the stained neurites are free nerve endings which then would also indicate sensory purposes. With the wAPC a hitherto unknown and abundant innervation morphology of single antigen presenting cells in the T-cell zone of lymph nodes of rats, mice and humans has been found, with that innervated cells showing a marker profile of macrophages and dendritic cells. The neurites innervating the wAPC with a dense neural structure enclosing only the cell body but no extensions did not show any hint for sympathetic or parasympathetic origin. Additionally, a dense appearance of single neurites with the same, but probably not efferent origin, can always be seen in the subsinoidal layer of the lymph node. Therefore both regions, for incoming antigens and antigen presenting cells i.e. the process of antigen presenting to T-cells, show neural elements with the same cytoskeletal structure. Because of these findings we propose the wAPC to be a central element in the synaptic communication between the immune and the nervous systems. Hence, the unique innervation morphology of the wAPC may be at least as important as all the neuroimmunotransmitters or scattered and often disjointed findings of autonomic nervous system innervation for further establishing one very meaningful expression: The sixth (immune) sense of the nervous system. Ader R, Cohen N. Behaviorally conditioned immunosuppression. Psychosomatic medicine 1975; 37: 333-40. Felten DL, Felten SY, Carlson SL, Olschowka JA, Livnat S. Noradrenergic and peptidergic innervation of lymphoid tissue. J Immunol 1985; 135: 755s-65s. Kurkowski R, Kummer W, Heym C. Substance P-immunoreactive nerve fibers in tracheobronchial lymph nodes of the guinea pig: origin, ultrastructure and coexistence with other peptides. Peptides 1990; 11: 13-20. Novotny GE, Kliche KO. Innervation of lymph nodes: a combined silver impregnation and electron-microscopic study. Acta anatomica 1986; 127: 243-8. Weihe E, Nohr D, Michel S, Muller S, Zentel HJ, Fink T, Krekel J. Molecular anatomy of the neuro-immune connection. The International journal of neuroscience 1991; 59: 1-23. Besedovsky HO, Rey AD. Physiology of psychoneuroimmunology: a personal view. Brain Behav Immun 2007; 21: 34-44. Blalock JE, Smith EM. Conceptual development of the immune system as a sixth sense. Brain Behav Immun 2007; 21: 23-33. Quan N, Banks WA. Brain-immune communication pathways. Brain Behav Immun 2007; 21: 727-35. Elenkov IJ, Wilder RL, Chrousos GP, Vizi ES. The sympathetic nerve–an integrative interface between two supersystems: the brain and the immune system. Pharmacological reviews 2000; 52: 595-638. Janig W. Sympathetic nervous system and inflammation: a conceptual view. Autonomic neuroscience : basic & clinical 2014; 182: 4-14. Bellinger DL, Lorton D. Autonomic regulation of cellular immune function. Autonomic neuroscience : basic & clinical 2014; 182: 15-41. Biaggioni I, Robertson D, David R. Primer on the Autonomic Nervous System. Elsevier Science. 2012. Berthoud HR, Neuhuber WL. Functional and chemical anatomy of the afferent vagal system. Autonomic neuroscience : basic & clinical 2000; 85: 1-17. Goehler LE, Gaykema RP, Hansen MK, Anderson K, Maier SF, Watkins LR. Vagal immune-to-brain communication: a visceral chemosensory pathway. Autonomic neuroscience : basic & clinical 2000; 85: 49-59. Quan N. In-depth conversation: spectrum and kinetics of neuroimmune afferent pathways. Brain Behav Immun 2014; 40: 1-8. Dantzer R, Konsman JP, Bluthe RM, Kelley KW. Neural and humoral pathways of communication from the immune system to the brain: parallel or convergent? Autonomic neuroscience : basic & clinical 2000; 85: 60-5. Wulfing C, Gunther HS. Dendritic cells and macrophages neurally hard-wired in the lymph node. Sci Rep 2015; 5: 16866.